We will go to Devil’s Bridge on our outward journey. This is a world-famous tourist attraction 12 miles from Aberystwyth. These unique waterfalls have attracted many thousands of visitors since the 18th century. You have a wonderful choice when arriving in Aberystwyth late morning. Catch the narrow gauge steam railway, spend time in the town and on the promenade or maybe get the cliff railway to enjoy amazing views! The steam railway is the finest way to explore the stunning Rheidol Valley. Opened in 1902, the steam trains have been delighting passengers young and old for over a century. Aberystwyth amazing seafront is great for visitors and locals both. The promenade is one mile long and will take you past all of Aberystwyth’s most prominent sights and landmarks – including the marina, harbour Aberystwyth and Devil’s Bridge on the Southern end of the prom, and all of the busy main beach, with Constitution Hill standing high above at the northern end. A wonderful walk! Aberystwyth Castle is accessible from the promenade. The best vantage point is at the end of north beach’s promenade, atop the 430 feet that is Constitution Hill. Here you’ll find the world’s largest Camera Obscura, which provides a bird’s eye view of more than 1000 square miles, in a 360 degree sweep around Aberystwyth. 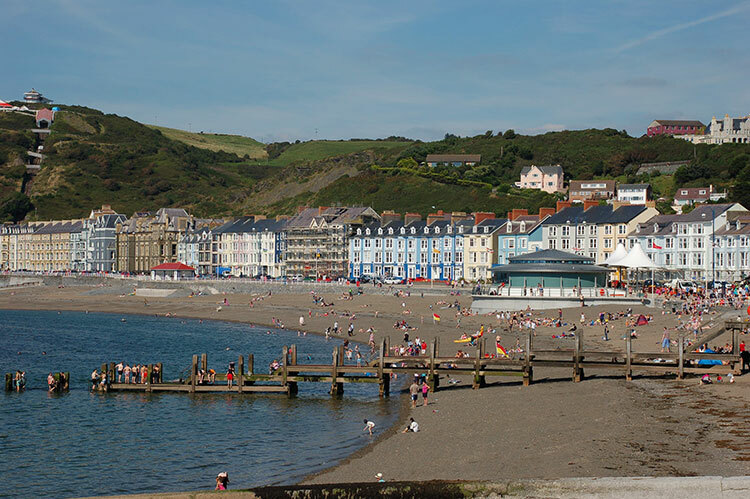 You can choose where to lunch in Aberystwyth – you are spoilt for choice!